From the back of a cell phone set to your shoes and earrings, everything is embossed with logos. These tiny symbols define the worth and social validation of almost every object we consume. The company logos or monograms might appear casually created and placed but there is a calculated, almost, scientific process behind them. They will only be able to achieve the desired impact if you have done the math right. 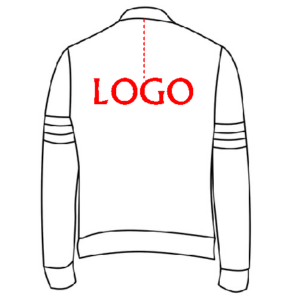 Here, we will discuss some of the basic principles of designing and placement of logos on apparel. Keep these rules in mind and you will get the things going in your favor. The process of designing logos starts with the selective information about the target market. First things first, the usual basic info starts with gender. Let’s lay it out clean and clear. – Either the font will be upper case or lower case. – If you are going to choose initials or symbols like bitten apple of iPhone or just the letters of DKNY. Both will have different impacts and this choice is pivotal to the effect. – Whether the monogram will have first or second initials of the name? It will also depend on the product and the sort of impact you want the logo to create. You want it crisp, short and personal or larger than life. It is the most integral part and the whole designing process revolves around it. In fact, the product will decide the entire designing process. Let’s say you are designing a monogram for a watch. It will be tiny in size and preferably very short and barely visible. On the other hand, the monogram for a car will be noticeable and extravagant. So, the product is the hero here and our story revolves around it. The choice of fonts is the trickiest part. To choose the right font for letters and make something meaningful out of it is the most creative part. Most of the fonts don’t gel well with the letters and result in obscure outcomes. It’s more like the process of trial and error. You have to combine many fonts and letters to reach the right one. Now that we are done with the basics of designing a logo, let us discuss the basics of embroidering it on the right place on Garments. Yes, the first thing it brings to mind is the Ralph Lauren Pony Embroidery and its ever growing logos. However, there are some set rules: If you are designing for a couple’s home linen then their last initial would embroider on the largest space. That is the rule of thumb but for other apparel variations, we will describe things in detail. The placement of embroidered logos is as much important as the designing. The aesthetics, visibility and impact of the logo is connected and conditioned with its placement. The right placement can strike the right notes. Now, let’s talk about the basics of placement. 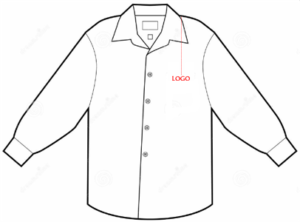 If the embroidery of a logo is to be done on a T-shirt then the placement of the logo must be in the center of the chest, 4 to 6 inches down from the neck seam. 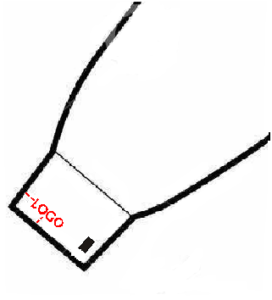 The smaller sized logos are usually placed on the left side of the chest 7 to 9 inches down from the shoulder seam. Machine Embroidery of your business emblem done on Polo Shirts and Tops is always placed on the left side of the chest, 7 to 9 inches down from the center of the left shoulder seam. If there is a pocket on the left chest then the embroidery is done above the pocket. Tip: Always do custom embroidery on a Polo Top or Shirt without a pocket on left chest. It will look elegant as compared to the ones with pocket on left chest. Give instructions to your embroidery logo digitizing department to digitize it no more than 4 inches wide. If the monogram is to be placed on the front of the jackets it must be placed 6 to 8 inches down from the left shoulder seam. 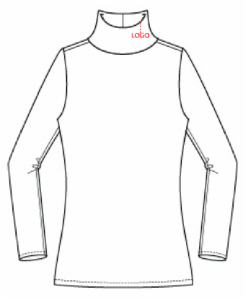 For back of Jackets, it is placed 6 to 9 inches down from neck seam and center aligned. 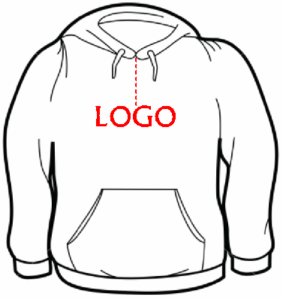 For Sweatshirts and hoodies, three places can be chosen for embroidery. In most cases, the bigger sized emblem on sweatshirts is embroidered in the center of front or back of the hoodies 7 to 9 inches down the shoulder seam. 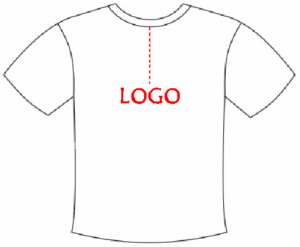 For a smaller logo under 4 inches width, it should be embroidered on the left chest 7 to 9 inches down from the center of the left shoulder seam. Monogram must be embroidered on top of the wrist and are placed quarter to half inch above the edge of cuff bottom. It is important to place it at 1 inch (+/- 10%) away from center of cuff in the direction of the button hole. When embroidering a monogram on cuff, always inform the embroidery logo digitizing department accordingly as the underlay and stitch densities are different for a cuff than for a left chest. Custom embroidery of Knitted caps and beanies is done 1 inch (+/-10 %) down from the bottom cuff and must be embroidered inside out. The width of the logo should be 1.5 inches maximum. Logo embroidery of a turtleneck is done between Center and Left shoulder seam. The logo should be on the left side of the neck cuff. 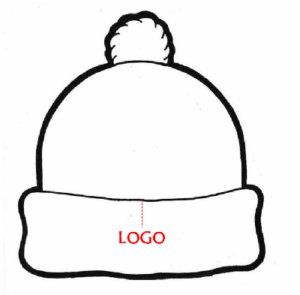 Do not digitize logo for embroidery more than 1 inch high for turtlenecks. Small monograms are embroidered on ties at two different places. If the custom ties are to be worn without a vest, the set place to sew out the logo is 2 inches above the tip. When wearing ties with vest, the design should be embroidered way above so that it should be visible clearly. It is crucial to inform embroidery logo digitizing department to digitize logo specifically for ties. Since different settings of push and pull compensation are done for silk ties rather than regular fabric and an improper embroidery logo digitizing will end up your tie in a waste bin. If you feel that any information is missing, then do not hesitate to contact us for a free expert advice. Absolute digitizing is an expert in embroidery logo digitizing and provides digitizing for embroidery at only $1 / 1000 stitches with a quick turnaround time of 12 to 24 hours.